Six days a week, Domenico De Marco, who turns 79 this year, shows up at Di Fara, his Midwood pizzeria, greeted by hordes of people already on line for one of his famous slices. Some shout Italian greetings to him as he climbs out of his daughter’s car and into the back of the pizza shop he’s helmed for 50 years. Others snap pictures of him through the takeout window, decorating their Instagram timelines with phrases like #worththewait and #themasteratwork. 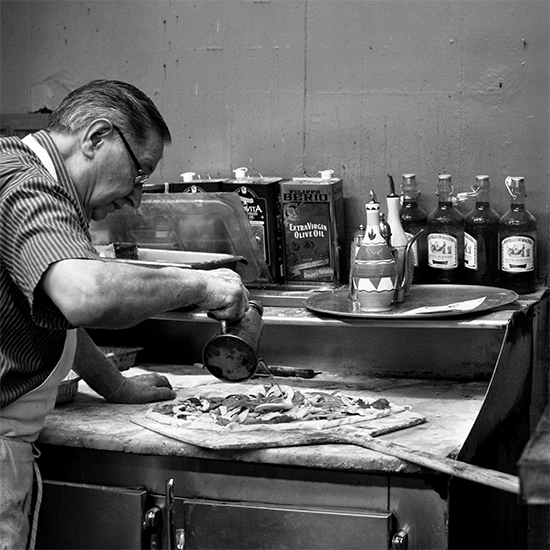 For many, a visit to Di Fara is something of a pizza pilgrimage. They make the trek to the Brooklyn neighborhood from all parts of Manhattan and from as far as California and even Italy and South Africa. Yes, pizza lovers travel internationally specifically to come to Di Fara. You never know what to expect when you get there. Will there be crowds? Will the tomatoes arrive from Italy that day? Will there be a film crew? Will there be an unannounced pizza tour bus parked out front? It’s not uncommon for Dom to stop by the shop on his day off to make sure everything is in order for the next day’s work. It’s on the way to his weekly Little Italy dinner at Buona Notte—a ritual he looks forward to all week. Every Monday, he orders the same thing—pasta e fagioli and a bottle of Amarone—served by the same waiter at the same table. Because, for Dom, a little bit of the expected is welcome. 9 a.m. Espresso. Preferably outdoors, since the majority of the day will be spent in front of a 900-degree oven. 11 a.m. Short espresso from Di Fara Dolce, the coffee shop he opened next door to his pizzeria, alongside a petite pastry, like a mini sfogliatelle or olive oil muffin. When he was getting ready to open Di Fara Dolce, he tasted a variety of espresso until he found the blend he liked made from Indonesian and Central American beans. 3 p.m. Espresso or a can of San Pellegrino Pompelmo, a few slices of imported prosciutto and freshly cut chunks of fresh mozzarella while standing in the back of the Di Fara kitchen. 9 p.m. Tomato salad made with fresh cherry tomatoes (the same the family oven dries for use on their famous cherry tomato and garlic square pie), extra-virgin olive oil and sea salt served on top of toasted Italian bread. A bottle of red. Preferably Amarone, but most likely one gifted to him by a longtime customer.